While food is an essential source of energy, nutrients, building materials, and even pleasure, it also contains compounds that can potentially evoke greater or lesser health disorders. Toxins can originate from the raw materials or invade during processing, transportation, and storage. They can be intentionally added in the form of "harmless" food preservatives or health-promoting functional ingredients that can become toxic in combination or under environmental stressors. The continuous physical and biochemical processes that food undergoes indicate that there is always the chance for toxicity in even the most innocuous foods. Skillfully combining theory and applications, Principles of Food Toxicology presents general and food-specific principles of toxicology with vivid examples of food-related poisons and poisonings from around the world. Beginning with an introduction to the principles of toxicology at the molecular, cellular, and organism level, the author uses highly detailed, yet accessible information, to emphasize the biochemical mechanisms of toxic effects. He explains the routes of absorption, metabolism, and elimination, toxic response, the determination of foreign substances, and the evaluation of toxicity and risk analysis. The second part is a systemic characterization of the most important food borne toxicants. The book divides a wealth of information into toxicants from plants and soils, environmental toxins, mycotoxins, marine and animal toxins, pesticide residues, food additives, and toxins that enter food during processing and storage, as well as digestion. The book also includes an extensive glossary. 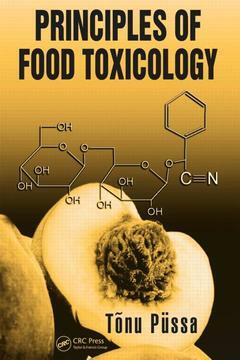 Drawing from the author's more than 30 years of experience researching and teaching biochemistry and toxicology, Principles of Food Toxicology provides a complete look at the mechanisms and sources of toxicity found in our food sources. BASICS OF TOXICOLOGY CONNECTED TO FOOD. Introduction. Routes of Xenobiotics in Organism. Toxic Response. Analytical Toxicology Determination of Foreign Compounds. Evaluation of Toxicity of Substances. Toxicological Safety and Risk Analysis. Internet Sources of Toxicological Information. MAIN GROUPS OF FOOD-BORNE TOXICANTS. Endogenous Plant Toxicants. Geochemical Pollutants that a Plant Assimilates from Soil. Environmental Pollutants. Mycotoxins. Animal Endogenous Toxins. Food Toxins from Sea. Pesticide Residues. Veterinary Drugs and Feed Additives. Toxicants Unintentionally Entering Food during Processing, Storage and Digestion. Food Additives. Vitamins. Glossary.